Not to be confused with Searcy County, Arkansas. Motto: Pride – Progress – Potential "The city where thousands live as millions wish they could." 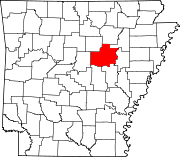 Incorporated on August 6, 1851, Searcy ( /ˈsɜrsi/ SUR-see) is the largest city and county seat of White County, Arkansas, United States. According to 2010 Census Bureau estimates, the population of the city is 22,858. It is the principal city of the Searcy, AR Micropolitan Statistical Area which encompasses all of White County. Like Searcy County, the city takes its name from Richard Searcy, a judge for the Superior Court of the Arkansas Territory. Searcy is the home of Harding University, a private, higher-academic, Christian university affiliated with the Churches of Christ and the state's largest private university. Harding College (its original name) moved to Searcy from Morrilton in 1934, having bought the campus of the defunct Galloway Female College, a Methodist college for women. Regional ice cream producer and distributor Yarnell Ice Cream Co. had its headquarters in the city's downtown area, until the company shuttered in July 2011. However, in April 2012 Schulze & Burch Biscuit Co., a Chicago-based wholesome snack manufacturer with a plant in Searcy, completed the acquisition of Yarnell’s Ice Cream Co. In July 1978 Wal-Mart opened it's first distribution center outside of Bentonville in Searcy. The facility is still open as a Sam's Club Distribution Center. In recent years, ITT, Maytag, and Kohler closed large factories in the city. Many companies associated with natural gas that supported the brief natural gas boom have also left the city and the economy has suffered. According to zillow.com, Housing has lost approximately 8% of it value since 2012. Latina Imports and Latina Nursery are also located in Searcy and is one of the largest female, Hispanic-owned companies in Arkansas. Spring Street (along with downtown Searcy's Spring Park) may refer to the early history of the Searcy area, when the community was known as White Sulphur Springs. As early as 1834, local springs with purported therapeutic properties initially drew visitors to the area, similar to the popular attraction to Hot Springs. During the American Civil War, the Battle of Whitney's Lane was fought near Searcy though the exact site is disputed. Searcy Landing, on the Little Red River, is the final resting place for some Union Army soldiers. Searcy was a stop on the defunct Missouri and North Arkansas Railroad, which provided passenger and freight service from 1906 to 1946 from Joplin, Missouri, to Helena in Phillips County in eastern Arkansas. On August 9, 1965, 53 contract workers were killed in a fire in a LGM-25C Titan II missile silo outside Searcy. It was one of the largest industrial accidents in American history. Despite having lost many factory jobs in the late 20th century, Searcy has recently experienced an economic revitalization. Much of the new revenue is derived from the leasing of mineral rights to natural gas companies. Some residents express concern about the environmental impact of the extensive drilling projects that have taken place. Searcy is served by two public school districts. Searcy Public Schools — including Searcy High School, three elementary schools and middle and junior high campuses — serve all but the far eastern portion of the city. That portion of the city is within the Riverview School District — a consolidation of districts serving Kensett, Griffithville, Judsonia, and surrounding communities in southeastern White County extending to West Point and Georgetown. Previously, the Riverview portion of Searcy was part of the Kensett school district; Riverview High School was built in eastern Searcy following the consolidation. Harding Academy is a K-12 college preparatory school enrolling more than 600 students. Harding University oversees the school, which resides adjacent to the university campus. Harding University, a private, Christian university affiliated with the Churches of Christ founded in 1924, has its main campus in Searcy. Harding moved to Searcy in 1934 from Morrilton. The university has developed and expanded to include 48 buildings on more than 350 acres (1.42 km2). With more than 7,100 students, Harding University is the largest private university in Arkansas. Arkansas State University Searcy, formerly operating as Foothills Technical Institute, is a technical campus of nearby Arkansas State University Beebe. It offers several two-year programs. In order to create drilling jobs for local populace, ASU-Searcy has partnered in training with the natural gas industry that is developing local natural resources. Searcy is located at 35°14′49″N 91°44′1″W﻿ / ﻿35.24694, -91.73361 (35.247043, -91.733706). According to the United States Census Bureau, the city has a total area of 14.8 square miles (38 km2), of which 14.7 square miles (38 km2) is land and 0.1 square miles (0.26 km2) (0.54%) is water. As of the census of 2010, there were 22,858 people, 8,140 households, and 4,495 families residing in the city. The population density was 1,287.4 people per square mile (497.2/km²). There were 9,244 housing units at an average density of 503.6 per square mile (194.5/km²). The racial makeup of the city was 86.8% White, 7.5% Black or African American, 0.5% Native American, 1.3% Asian, 0.1% Pacific Islander, 1.09% from other races, and 1.9% from two or more races. 4.6% of the population were Hispanic or Latino of any race. There were 8,140 households out of which 27.4% had children under the age of 18 living with them, 51.8% were married couples living together, 10.8% had a female householder with no husband present, and 34.1% were non-families. 29.5% of all households were made up of individuals and 14.7% had someone living alone who was 65 years of age or older. The average household size was 2.28 and the average family size was 2.86. In the city the population was spread out with 20.5% under the age of 18, 23.4% from 18 to 24, 23.3% from 25 to 44, 17.8% from 45 to 64, and 14.7% who were 65 years of age or older. The median age was 30 years. For every 100 females there were 97.5 males. For every 100 females age 18 and over, there were 97.5 males. The median income for a household in the city was $33,415, and the median income for a family was $41,334. Males had a median income of $32,445 versus $21,142 for females. The per capita income for the city was $19,427. About 11.7% of families and 15.0% of the population were below the U.S. poverty threshold, including 18.1% of those under age 18 and 8.0% of those age 65 or over. Ginger Beebe, wife of the current governor and first lady of the state, is a native of Searcy. Beth Ditto, singer-songwriter of the indie rock band Gossip. Odell Pollard, state chairman of the Arkansas Republican Party from 1966–1970; and an ally of the late Governor Winthrop Rockefeller, practiced law in Searcy from 1950–2005. He was the Republican national committeeman from 1973–1976. Weston Dacus, played for the University of Arkansas as linebacker and was signed to the Arizona Cardinals as an unsigned free agent in 2008. He played two seasons with at Arizona and later joined the United Football League. He plays for the Florida Tuskers. The climate in this area is characterized by hot, humid summers and generally mild to cool winters. According to the Köppen Climate Classification system, Searcy has a humid subtropical climate, abbreviated "Cfa" on climate maps. ^ "Searcy (White County)". Butler Center for Arkansas Studies at the Central Arkansas Library System. http://www.encyclopediaofarkansas.net/encyclopedia/entry-detail.aspx?entryID=1016. Retrieved 29 January 2014. ^ "Annual Estimates of the Population for All Incorporated Places in Arkansas" (CSV). 2005 Population Estimates. U.S. Census Bureau, Population Division. June 21, 2006. http://www.census.gov/popest/cities/tables/SUB-EST2005-04-05.csv. Retrieved November 16, 2006. ^ "H. Glenn Mosenthin, "Missouri and North Arkansas Railroad"". encyclopediaofarkansas.net. http://www.encyclopediaofarkansas.net/encyclopedia/entry-detail.aspx?entryID=5103. Retrieved April 28, 2013. ^ Stumpf, David K. (2000). Titan II: A History of a Cold War Missile Program. University of Arkansas Press. ISBN 1557286019. ^ Pat. "Natural State No More", The Daily Citizen (Searcy), Sep 2, 2007. Retrieved September 2, 2007. ^ "Learning and Growing in Christ". Liberty Christian School. http://libertychristianschool.net/index.php. Retrieved July 10, 2013. ^ Willems, Jack. "Drill Training Program Coming to ASU-Searcy", The Daily Citizen (Searcy), Dec 19, 2007. Retrieved December 20, 2007. ^ "Governor's biography". Arkansas Governor Mike Beebe. Arkansas.gov. http://www.governor.arkansas.gov/gov_biography.html. Retrieved November 15, 2007. ^ "About Ginger". First Lady of Arkansas Ginger Beebe. Arkansas.gov. http://www.arkansasfirstlady.com/about_ginger.html. Retrieved November 15, 2007. ^ "Mark Biviano, R-46". arkansashouse.org. http://www.arkansashouse.org/member/258/mark-biviano. Retrieved December 29, 2013. ^ "George W. Bond". findagrave.com. http://www.findagrave.com/cgi-bin/fg.cgi?page=gr&GRid=84362270. Retrieved August 5, 2013. ^ "Benjamin Marcus Bogard (1868–1951)". encyclopediaofarkansas.net. http://www.encyclopediaofarkansas.net/encyclopedia/entry-detail.aspx?entryID=1593. Retrieved August 2, 2013. Muncy, Raymond Lee. Searcy, Arkansas: A Frontier Town Grows up with America. Harding Press: Searcy, 1976. The Daily Citizen, the local newspaper. This page uses content from the English language Wikipedia. The original content was at Searcy, Arkansas. The list of authors can be seen in the page history. As with this Familypedia wiki, the content of Wikipedia is available under the Creative Commons License.